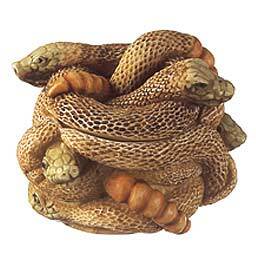 This box figurine, a pile of entwined snakes, is one of the first that featured Peter’s trademark mouse. What a terrifying place for the mouse to make his debut - between coils of snakes! There are no inscriptions, inner carving, or hallmarks. Peter left his initials on the back of a rattler at the base and P.C. can be found in some interiors.